I'm Here. I'm Queer. What the Hell do I read? : The 2012 Comment Challenge Week One Check-In! Have you noticed any changes in how you read blog posts? Have you seen any difference (number, quality) in the comments on your own blog? And I'll share that I've put together some pretty awesome packets of books as prizes (more on that later...) For now, let's let the process be the prize, and keep the commenting, and the community interaction, going! And if you're looking for a good list of kid lit blogs to explore in your own commenting rounds, you should check out the list of the over 140 participants in the 2012 Comment Challenge at MotherReader's sign up post! So far so good! I have commented on 35 different blogs and even joined most of them. The hits and comments on my own blog have increased quite a bit. I even gained a few new followers (not in a cult-like way). Thanks for setting up the challenge and I will check in again next week. I've been loving the comment challenge so far. It encourages me to look beyond the usual blogs I read (I'm trying to comment on as many different blogs as possible), and it makes me less self-conscious about my comments. I have discovered some great new bloggers, enjoyed more comments on my blog and felt freer to leave short, fun comments rather than hesitate because I feel I have nothing erudite to say! I've managed more than 35 comments because of Pam's encouragement just to get out there and leave our imprint! Started a day late, but it was fun to catch up. Running tally: 36. I've seen more people stopping by but very little comments yet...perhaps my audience is different than those of the challlenge. But I'm loving seeing others set ups. I'm being very systematic & moving through the CC blog list five at a time. So I have visited and commented at 35 different blogs in a week, getting me out of my "silo" where I usually just hunker down and write, write, write book recommendations. Some were blogs that I loved so much that I subscribed, while a few were far outside my current interests. Yet all spoke to me of books and creativity and sharing stories with the world - big cheers! I've definitely seen more traffic on my blog since the Comment Challenge began! Thanks to you and MotherReader for organizing the Challenge - see you next week. I've definitely been commenting more, though I don't expect to meet the 100-comment mark. We've had a number of new visitors to our blog who are also participating. Thanks so much for organizing this again! I'm loving the Comment Challenge this year! Thanks to Lee and Pam, and to everyone who's visited and commented on my own little blog--so inspiring and fun. Off to make more comments--thanks again! I'm kinda new at this... so its been a little hard to make random comments without feeling like an idiot. But I have had a little traffic on my new blog, which is good. Gotta learn sometime, right? Thanks for putting the challenge together. I've found some great blogs to follow in the process. I'm doing pretty well so far. I haven't been able to comment the last couple of days, but if you average out the comments I've left, I'm right on track! I always comment a lot, but this has offered a whole other cast of characters to meet & read. The biggest problem I have is that I'm adding quite a few new blogs to my reader. Guess that's not a really big problem; I always learn a lot from those out there! Thanks much for doing. I'm ahead and am really enjoying this! I'm reading new blogs and finding all sorts of neat ones. It's easier than I thought it'd be. In a jiffy, I can have it done. So here is my update on the 2012 Challenge Comment so far. I started a little bit late so I've been making at least 10 comments a day and gone to 30 different blogs! Yeah! I've made the effort to visit anyone who has made a comment on my blog, people that are participating in the 2012 Comment Challenge and Followers. I'm so glad I joined this Challenge. It's easy to get stuck in a bubble-even in the blogging world. But we all love it when people come to our blogs-comment, leave feed back, and follow. We all work hard on the reviews and topics. It's nice to be recognized. I have really enjoyed the challenge. I have met a number of new friends and reconnected with some others. I added quite a few to my reader. It is an awesome way to meet new kidlit folks. I'm really enjoying connecting with other kidlit bloggers, though it does take time. I signed up three days late, however, I'm happy to report that I've commented on 35 blogs. It has been worth it! Thank you. This challenge has been great! Cannot believe its been a week already! I found some new blogs that I absolutely love. I also have seen an increase in some commenting on my blog. However, wish more people would Follow my blog. I try to follow those I have been commenting on. Hi Lee! I'm over 40 so far! I find that I can't stop at 5 a day. I choose them randomly from the list. And I've gotten some really nice feedback on my blog. Thanks! Hello Lee & fellow comment challengers! First of all - Happy happy Birthday to Lee, so glad to have "met" you on the web. I'm doing pretty well with the challenge so far. I'm up to 36 comments and have added at least 12 new blogs to my list that I follow regularly. As a new blogger, I've definitely appreciated the comments and feedback from folks. Looking forward to the next week! I've found a lot of good blogs this year and have been commenting, but have kept very poor records of exactly where I've been. I've gained a few followers as well, which is nice in the depressing month of January! I just started the challenge today and I have 5 comments. I know I am going to have to play catch-up, but I am SO excited about meeting all these book bloggers. We've seen some increased traffic. Not too many more comments. But two things I wonder about. We signed up after the blogfest started and we're way down on the list. #131 to be exact. Hopefully everyone's not starting at #1 and working their way systematically down the list...The other thing is we are the only group blog that I've seen in your Comment Challenge. Maybe different to relate to a group blog? Not just one personality to bond with. Maybe it's like the group competition on X Factor. They couldn't compete with big individual personalities (all of you). But I like to think of us as a diverse group that offers something for everyone: a poem about the meaning of success one day, The Timbertoes the next, a historical fiction writer who fired a black powder muzzleloader so she could write intelligently about using one in her novel, a Girl Scout leader whose troop wrote and performed a rendition of Rocky Horror Picture Show (now on You Tube), amazing her with their stick-to-it-iveness when they were having fun. Anyhow, thanks for the chance for us to become familiar with more great blogs. We joined Monday and split up the work. Between Juliet Bond, Regina Gort, Kathy Wiechman and me (Kim Van Sickler) we've visited 35 blogs so far. Lots more visiting to do! I'm at 68 -- almost ten a day! I've received some amazing comments, too, even though mine is a more general book blog with a sudden twist toward fitness for January. Thanks, everyone! This has been awesome. I find 3 hours go by in a snap after enjoying everyone else's blog. I'm getting more traffic too and I'm actually getting some comments. Awesome! Thanks everyone. Looking forward to another couple of weeks of this. Then I won't be able to break the habit! I was down and out for a couple of days with a cold, so I didn't comment on those days. BUT... I doubled up on Monday and Tuesday so I'm right on schedule at 35 comments to date. I found wonderful new blogs I never would have known about and connected with some like-minded peeps on my own blog. My TBR pile list is also getting dangerously long. Seriously... how WILL I read all of the great new books I'm learning about? I'm loving this! I tend to be a big-time lurker so this challenge is motivating me to comment far more on blogs I've already been following. So far I'm over 40 comments total for the first week, and as a kidlit blogging newbie, I love seeing more traffic on my own blog too! I'm stopping by. I'm late to the party. Good job on your number of comments. I've been getting many more comments than usual, and actually replying to them too. I'm at 32 comments at the moment (this is 33). It's been a little tricky making time to comment, so ten of those were made today, but the challenge is definitely helping me read other people's blogs more thoughtfully. I'm a little behind at 26, but I'm hanging in there! It has been a lot of fun discovering new to me bloggers. They have some great insights on books and characters and kids! And it's fun to get more traffic on my own blog. More incentive to keep writing and improve post quality. I agree with anniecardi--the impetus to actually leave a comment helps me not to overthink it! I'm at 33 comments so far, but I'm just sitting down to hit today's blogs. I'm mostly visiting new blogs during the Challenge; although, I'm re-visiting a few, too. I'm discovering all kinds of new blogs. Spurred by the post of another Comment Challenge participant, yesterday, I decided to host a contest on my blog. I hope you will all come play. I'm loving this. Problems include tons of time reading new-to-me blogs and adding more blogs to my reader than I can probably keep up with--good problems to have! I'm at 38 comments, although not on 38 different blogs. I'm mixing it up between using this as motivation to be a better reader of the blogs I do follow, and to get to new blogs. And I'm definitely seeing an uptick in comments at my blog as well--hooray! I'm loving that the comment challenge is making me think about the blogs I'm reading more! I have also noticed a lot more comments on my own blog! It's harder on the weekends because I think people are posting less in general. checking in to say that I am on target with 35 comment for the seven days. I have found some great new blogs, and have been excited about blog-reading again. It wasn't even difficult to start commenting again - like riding a bike! Glad we're doing this! It's going very well so far! I've commented on 30 different blogs - this has been a great way for me to break out of my comfort zone and discover a lot of new blogs that I wouldn't normally check out. Best of all, I'm seeing lots of interesting conversations taking place in people's comments. Going well! Met so many new readers and writers. Thanks! 49 comments so far. I love this challenge. It is as if the teacher gave "chat with friends" as an assignment! I have discovered over 15 new blogs to which I now look forward to returning and I am adding new ones every day. I am using the challenge as motivation to post to my own book blog daily for the duration as well. Thanks so much for hosting! I am really enjoying this challenge. I have even more traffic on my blog than when I had a giveaway, and it's all from people who love kidlit, rather than peopl I know irl who are just humouring me. The list of blogs at Motherreader is fab, I am enjoying going through it. At 36 comments so far, looking forward to the next 70 or so too. The biggest effect for me is my swelling blog list. The other fun thing is all the new comments on my blog, although it's funny that most of my reading this week isn't kids books. Oh well. 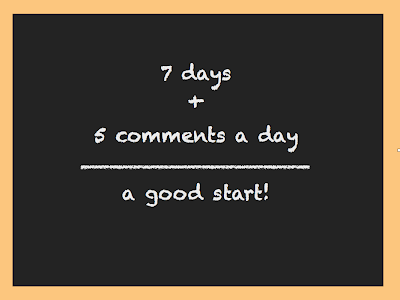 I count up to five comments each day, and then try to keep commenting without counting. So technically I may end up over the limit, but I know I won't be under. One day I couldn't get at the computer, so I had to do ten comments the next day, but I let myself do some "great post" kind of things so I wouldn't stress. I'm about three days behind . . . counting this comment, I'm at 22 comments for the past week. I'm hoping to catch up over the weekend. I'm feeling less shy about clicking over and saying, "Yeah, me too!" or "Hmm, I didn't get that" or even "Thanks for that." It does take a little more time, but I'm enjoying that interaction. Happy Birthday! This is my 35th comment. I've found some great new blogs to read. I've also had lots more comments to my blog than I'm used to - which is really great, and puts a little pressure on me to keep posting! Thanks for hosting this fun challenge! I am at 35 so far. I am loving the challenge so far. There are definitely more comments on my blog and I have found a lot of new fun blogs as well. Thanks for setting this up. Happy birthday to you, Lee! This has been a great challenge. I'm on track, posting 5-10 comments each day. It's been so fun to discover new blogs and to post on a few old favorites that I'd been neglecting. Thanks again to you and Pam for hosting! I was determined to get through the list on the Comment Challenge this week (and I made it under that wire -- it's 11:38 p.m. Wednesday as I write this). I didn't read them all, I didn't comment on all the ones I read, but I did make 45 comments this week, mainly on blogs I've never visited before. (I also commented on the blogs I comment on regularly, but didn't count those.) I have followed many of the new ones I encountered, have learned and been inspired, have also learned what quickly turns me off (sorry, but it happens) and what quickly grabs my attention in a blog. I started a little late so am only up to about 30 now but I'll keep going until I've commented on them all. Yes, I'm now thinking about commenting everytime I read a blog - and about the relationship between what I read and what I do. I'm enjoying it! Seven days, 35 comments. So far, so good. I've only been commenting on the blogs I have in my reader. 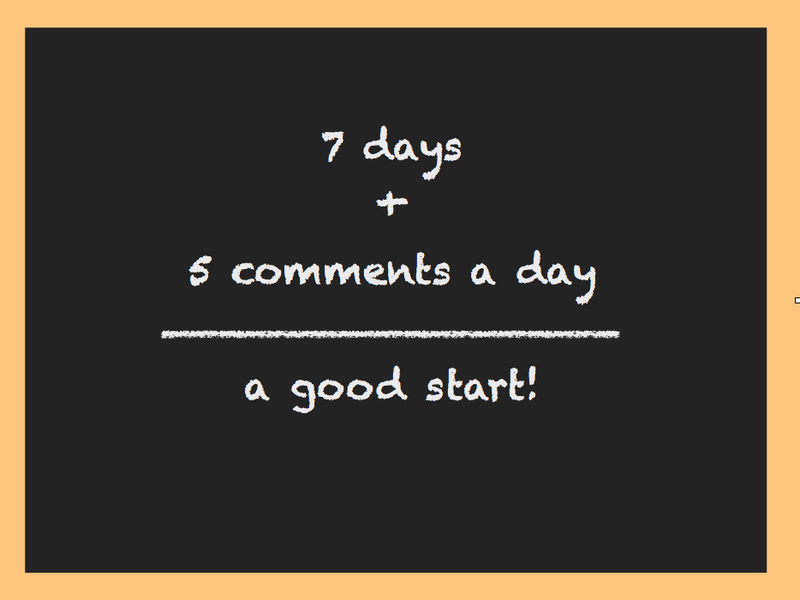 I'm hoping that on Monday, I can start tackling the blogs of the Comment Challenge folks! I learn so much when I leave my own neighborhood! It's been fun to have people discover our blog this week. Franki's been taking part in a multi-blog Digital Writing Workshop theme all week. We'll be back to our typical mish-mash of programming next week! I'm at 45 comments (not counting comments own my own blog in response to other people's comments. So far so good, just wish I had more time to explore! With working and kids and all, I'm a bit behind where I want to be. On the other hand, I'm actually making the effort to click through from my reader (see, I'm here!) and make a comment, which is something I'd become too lazy to do. Lots of great comments on how your commenting is going - thanks, all! This is an excellent challenge. I do enjoy finding all these new blogs and feeling part of a wider community of kid lit writers and artists. I joined this challenge only yesterday so am behind, but am rapidly catching up as I'm leaving more than 5 a day. Happy Birthday. I'm making my five a day. If a particular post doesn't move me to comment on read and older one. Happy Birthday Lee! The comment challenge has been great. Lots of new visitors stopping by the blog offering lots of encouragement and positive thoughts. I love it! I am a little behind where I should be -- 33 comments. But, this is more than I have ever done in such a short time. Not to mention, reading all the posts! There is a lot of good stuff out there! Thanks again for putting this challenge together. It already has shown me the importance of thoughtfully commenting on someone's blog and reciprocating a thoughtful response to those who visit my own blog. I have started out terrbily! I only have 14 comments, but I'm hoping to catch up! I really need to set aside time to read all my blogs! Yikes, good thing I can count this as one of the 29. I signed in late and am behind at 25, but I'll be catching up. I really have enjoyed getting to know more kidlit blogs. I share reviews with my high school daughter who loves to read and then have books to read at the elementary. Comments really fuel my blogging. Thanks for hosting. I've been moderately commenting... not up to the challenge but it's probably 300% more than usual. Enjoying seeing new sites from Mother Reader's list that I never would have stumbled across on my own. Let's see how week 2 goes. Wowza! Lots of people are on the ball! I started out strong but have begun to fall off the wagon! Somebody help me! Oops! Forgot to check in yesterday. But I have been doing all my comments--and visiting a lot of very cool blogs! I've been a little slow on the upstart. Not 5 everyday. But I have tried to make up some of what I miss when I do start blog surfing. I've loved the challenge. I have had more visits, but more importantly, I'm making connections with people who are doing similar work. And I've found some really awesome sites that I will want to revisit. I got a little off schedule yesterday after the fuss surrounding our recent snowstorm here (we hadn't had any real snow accumulation since November and the kids were ecstatic), but last week I kept the pace up pretty good. I'm at 33 with this comment. Hoping to get back on track this weekend. So far so good! I've always made a practice of leaving a comment on blogs I read - because I know how satisfying it is to know that someone was interested in/curious about/learned something from what you write. But the challenge has me moving out of my comfort zone (teachers and teaching) and I've discovered some wonderful new blogs I will continue to follow. I am way behind since this week I lost both internet and my computer bit the dust. But now, new computer, rebooted internet and I'm going to get commenting. I've kinda lost count of how many comments I have made, but I have enjoyed getting comments on my blog. I have found some really interesting blogs and websites to follow through this. Thank you for letting me join with the comment challenge. It's been great. I'm actually ahead of my target because I'm having fun. I even won a book because of the challenge. Thanks for hosting this. Oops- missed checking in on Wednesday this week, but I've kept up the 5/day comments and I'm adding in 2-3 a day to catch up for my late start. Surprise- it actually is beginning to g=feel like a habit!